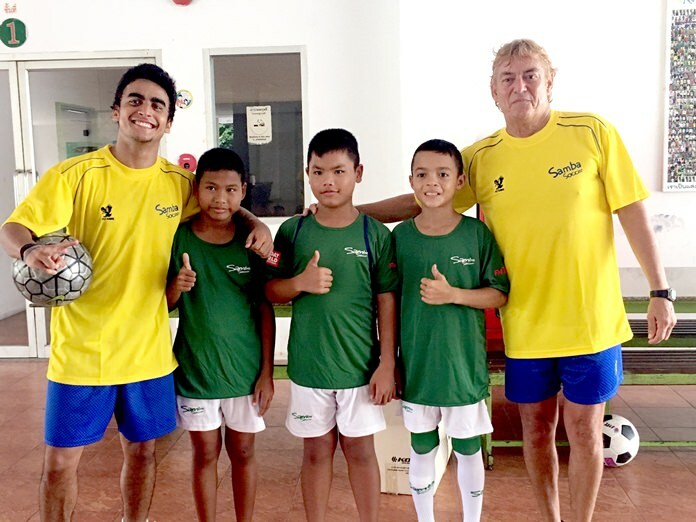 Lionel Izaaks and Gabriel Albequerque from the newly opened Samba Soccer in Pattaya visited the Father Ray Children’s Home, part of the Father Ray Foundation, on May 10 with a view to offering free soccer training to the resident boys, and girls. Lionel Izaaks (right) and Gabriel Albequerque (left) from the Samba Soccer academy in Pattaya pose with budding football stars at the Father Ray Children’s Home, Wednesday, May 10. On their first visit there they met the boys from the Home and had a kick around while Gabriel showed the eager youngsters a few ball juggling tricks, which got even more of the boys interested and all very excited that they will now have regular professional coaching. 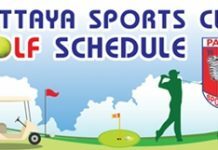 Regular training sessions will start at the Home on the afternoon of Sunday, May 21, and the boys from the Father Ray Children’s Village will also attend. The Samba Soccer school opened at the beginning of May at Star Soccer on South Pattaya Road and offers a youth football academy with daily workshops for children aged 7-18. There will also be multi-activity classes for children aged 4-7 on Sunday mornings. The aim of Samba Soccer, says director Lionel Izaaks, is to produce professional football players able to ply their trade here in Thailand or, if they are good enough, be sent overseas for trials. For more information, call 064 792 9701 or visit website: www.sambasoccer.eu.